Úšt&ecaron;k (former German name: Auscha) is situated at an elevation of 212 m on a plateau above the confluence of the streams &Ccaron;erný potok (Haberbach) and Úšt&ecaron;cký potok (Munkerbach). The municipality has a population of about 2,700 (2006). The picture on glass no. 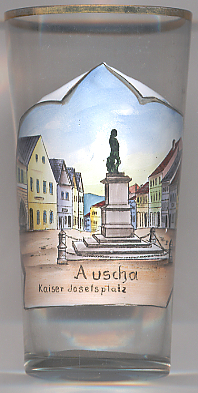 2408 shows a view of the Kaiser Josefsplatz (today Mírové nám&ecaron;stí, Peace Square) with the monument for Emperor Josef II.